The blue plastic squeegee is a budget squeegee and is well worth the money to assist with the fitting of vinyl prints or cut vinyl. This product is recommended mainly for products that come with a clear application film such as cut vinyl. 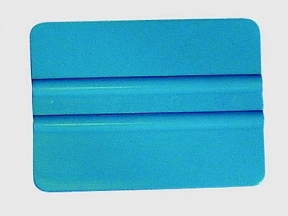 If you intend to use your plastic squeegee on a product without application film, we recommend you place your silicone paper over the print surface and squeegee over the top to protect the printed finish.